(Wednesday, December 05, 2018) Tuscarawas County, Ohio – The annual Christmas Tour of Homes is set to begin this weekend. A tradition of the past 25 years, the Christmas tour kicks off the holiday season in Tuscarawas County. 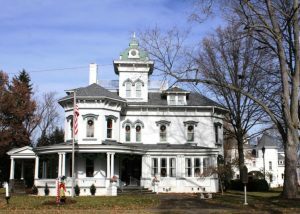 Christmas Tour of Homes Co-Chair and Heritage Home Vice President Patti Strickling says this Christmas tradition started by the Dennison Depot’s Women’s Committee in hopes for residents to get inspired by the holiday décor. Strickling says there are stops at a couple of older and newer homes, a stop at Dennison’s second oldest church, Immaculate Conception Catholic Church and the final stop will be at the historic Reeves Victorian Mansion and Museum. The self-guided tour will take place on Sunday, December 9th from noon to 5:00pm. Tickets are $18 per person and can be purchased at Geib Funeral Homes in New Philadelphia and Dover, First National Bank of Dennison in Dennison, and Pam’s Posies in Dover.